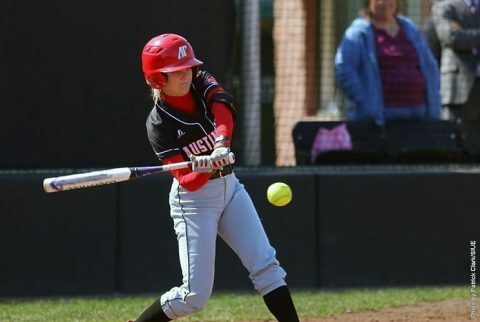 Clarksville, TN – Austin Peay State University’s softball team had its seventh-inning rally come up short versus Ohio Valley Conference leading Jacksonville State, Saturday at Cheryl Holt Field, as the Governors fell 4-1 in Game 1 and 5-1 in Game 2. The Govs (6-33, 2-19 OVC) trailed the Gamecocks 4-0 heading into the bottom of the seventh inning, but Kacy Acree opened the inning with a double and moved to third base an out later on a single by Sidney Hooper. Autumn Hanners would follow with a walk to load the bases, with Kendall Vedder driving in the first run of the game for Austin Peay when she drew a walk to force in Acree. Hanners had the other Govs hit in Game 1. But Jacksonville State (30-14, 19-0 OVC) starter Whitney Gillespie (11-1) struck out the next two Govs hitters to end the game. The Gamecocks had taken the lead in the top of the third inning, scoring three runs, with Jordan Bullock driving in two with a triple and Jamie McGuire the other with a single. The Gamecocks other run came in the fourth inning on a double by Anna Chisolm. Bullock, Chisolm and Ella Denes all had two hits each for JSU. In Game 2, Austin Peay got off to a 1-0 lead in the bottom of the first, with Chandler Groves leading off the inning with her second home run of the year. Jacksonville State would tie the game 1-1 in the second inning on a home run by Leila Chambers and take the lead 2-1 on a home run by Denes in the third inning. The Gamecocks would add to their lead in the fourth inning, picking up a run on an RBI double from Caitlyn Sapp and two more runs in the seventh on a double by Denes and an error by the Govs for the 5-1 final. Denes and Chisolm would lead the Gamecocks in Game 2 with two hits each. Taylor West (10-5) picked up the win; while Gillespie pitched the final 1.2 innings for her second save of the year for JSU. Danielle Liermann led the Govs offense in the nightcap going 3-for-3. Austin Peay returns to action, noon, Sunday, when they host Tennessee Tech at Cheryl Holt Field.